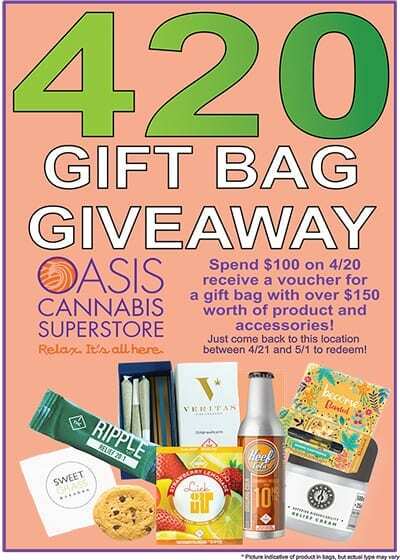 Oasis Cannabis Superstore is Denver’s most unique recreational dispensary. No other dispensary has a better selection of recreational marijuana and medical marijuana. Oasis features over 200 unique marijuana strains. We also also stock 180 different pre-rolled joints. Oasis Superstore also has the best cannabis smoking accessories & custom glass selection pipes in Denver. There is no other marijuana store like it anywhere! Relax, It’s all right here! We have two convenient Denver dispensary locations. Our original Denver South Superstore is located at Evans & Monaco. Our Denver South Superstore sells both recreational cannabis & medical cannabis products. Our new Denver Northwest Superstore is at Sheridan & 44th. Our Northwest Superstore is recreational sales only. Oasis works with local craft cannabis growers. We feature multiple premium craft marijuana growers. Westword Magazine named Oasis Cannabis Superstore “Best Cannabis Selection in Colorado.” Our marijuana products are fresh due to our high sales volume.